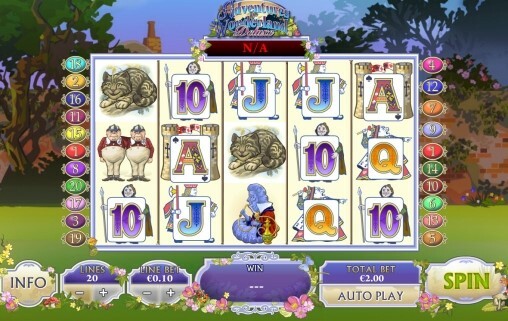 Adventures in Wonderland is a 5 reel, 20 payline slot game by Ash Gaming. The game is modelled on the book 'Alice in Wonderland' by Lewis Carrol and the imagery in the game is largely similar to the Walt Disney movie of the same name. 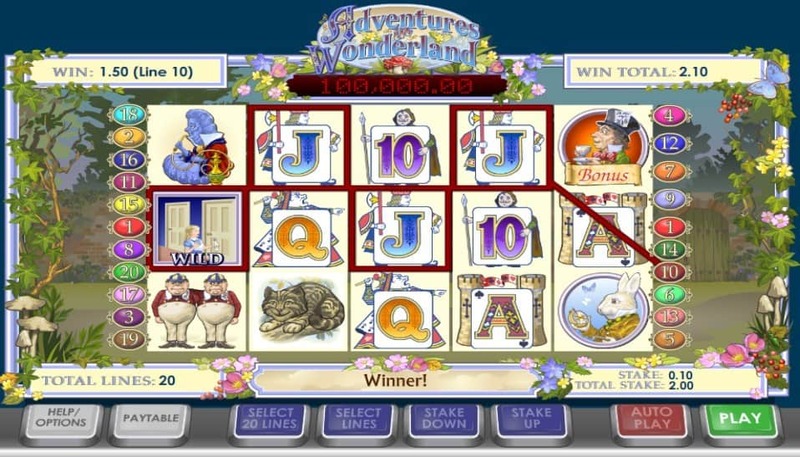 Adventures in Wonderland comes with an array of exciting bonus games on offer to keep players interested and give them a break from the reels. The Mad Hatter's Tea Party feature is activated when players land 3 or more of the Mad Hatter characters on screen. Once the bonus game is activated you will need to select one of four characters to serve tea to (March Hare, Mad Hatter, the Door Mouse or Alice). Your awarded prize will depend on how long your guest drank the tea you served them for. The prizes won are usually multipliers of between 10x and 20x. The Mad Hatter's Tea Party bonus round also has the opportunity to randomly unlock the progressive bonus, which happens when a magical sugar spoon appears and starts serving sugar. The Rabbit Hole feature is triggered when the rabbit hole symbol appears on the middle reel. In this bonus game, Alice will appear t to fall down the rabbit hole. As she falls she will collect prizes that is multiplied to the initial bet. The maximum prize in this bonus round is 22x your bet amount. Adventures in Wonderland also has both a Wild symbol and a Scatter symbol that each have their own special features. The Wild symbol is an icon of Alice holding a potion bottle. These Wild symbols can stand in for any of the game's standard symbols as well as reward you with 10,000x your bet if you happen to land 5 in a row, and 1000x if you land 4. The scatter symbol is the White Rabbit symbol. Landing 3 or more of these will activate the Pocket Watch Free Spins Bonus. The time on the rabbit's watch equals the amount of free spins awarded, with the maximum being 20. The rabbit then hops onto another symbol, turning his chosen symbol into a Sticky Wild for the duration of the free spins round. You could enjoy between 3 and 5 Sticky Wilds during the free spins bonus. Atlantis Queen is a seemingly simple video slot from Playtech, but has some interesting bonus features, which add to its appeal. The bonus features are easily triggered, easy to understand and add to profit potential. The multitude of betting options, as well as the AutoPlay feature, are a definite plus as it allows the game to suit a variety of players preferences. The theme may not be highly original, but the high quality graphics make it stand out from similar games within this category.